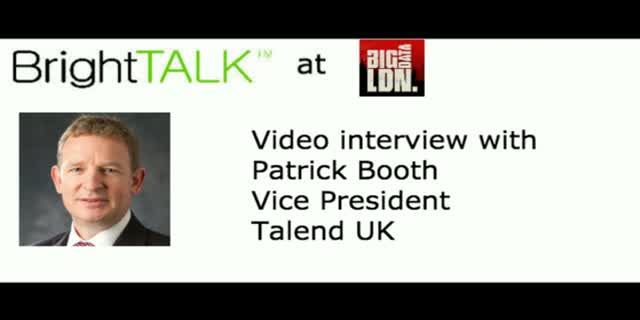 Listen to our interview at Big Data LDN with Patrick Booth, VP at Talend UK. - When it comes to big data, what do you see as the pros and cons of vendors adopting a new generation approach based on ‘open source’ compared to a legacy proprietary approach? -What are the main challenges vendors face in taking advantage of new big data trends like Spark streaming, for example, to deliver business benefits? -How easy is it for vendors to innovate in the open source environment? -What are the biggest issues you see customers facing in terms of adopting new big data technologies and what are the main challenges vendors have in addressing these barriers? - In terms of the management of big data and data integration in general, how important is it that organisations are able to leverage an agile development environment?